I leave for Boston in just 13 days--it's coming up so fast! Today was my last long run before the Heartbreak Hill Half. Next week, I'll probably do 8-10 miles, which is still a long run, but it's a taper week. I wanted to make sure I got in 12-14 miles today. Yesterday, I made a plan to drive an hour north of here to a really hilly Metropark. Since the Hearbreak Hill Half is going to be pretty hilly, I wanted to do a run with hills, and we don't have any routes like that near where I live. I mapped it out, wrote out directions to get there, etc., and then I got a call from my little brother, Nathan. He said he was going to run when he got off work in the morning, and asked if I wanted to run with him. Nathan never invites me to hang out with him, but since he started running, we have something in common. He only planned to do about four miles, but I really wanted to make it work out, so I decided I could just run before and/or after the run with him to make up 12. I told him to meet me at the recreation center parking lot when he left work (he had to to a physical test--push-ups and sit-ups-- at work, so he wasn't sure what time it would be). I drove to the recreation center at around 6:50, because Nathan guessed it would be 7:30-ish when he got there, and I decided to run a few miles before he got there. I parked my car and headed out. Right when I reached a mile in, Nathan sent me a text saying that he was at the recreation center already. So I turned around, and had him come pick me up. I got in 1.5 miles. There were tons of teenagers flying down the road in the their cars to get to school, so I thought we'd be safer if we went to the State Park to run. We took Nathan's car to the Kroger parking lot to drop it off, and then my car to the State Park, because I had a sticker for park entry. We parked in there and headed out for four-ish miles. It was fun running with Nathan! The miles passed so much faster than they would have if I was running alone. I really wasn't having a good run-day, though. I just felt really tired, and it was hard to maintain pace. When we got back to my car, I told Nathan to drive my car back to his car at Kroger, and then I planned to run to my car. I had only run just over five miles when Nathan left, so I still had seven miles to go. I wish I'd thought to take a picture of Nathan and me, but it didn't occur to me until after he left. 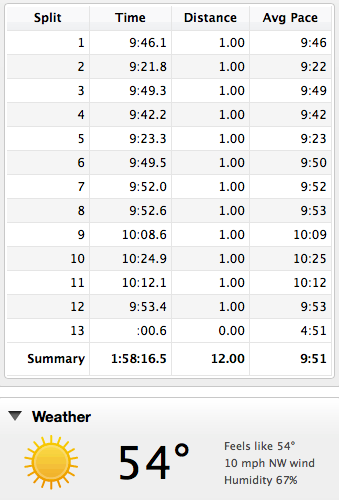 I decided to keep my pace very easy, close to 10:00+ min/mile. At around mile six, my mom drove past me, and stopped to ask if I was okay or if I needed a ride or anything. I really wanted to stop then, but I knew it was important to get in my mileage today, so I told her I was fine, and kept running. When I reached Kroger, I was at mile 8.25, so I still had 3.75 miles to go. I just ran an out-and-back from there, heading out until mile 10.1, and then turning around. That last stretch was SO difficult. It was sunny, and there wasn't much shade along that stretch of road. The last quarter-mile, I was so ready to be done, I picked up the pace the best I could to just hurry up and get to my car. Even though the run was broken into chunks, it still felt like it took forever (except for the four miles I ran with Nathan). I'm actually really glad I didn't stick with my original plan to go to the hilly Metropark. I think it would have been a very miserable run there! And it was fun to run with my brother. I think he's going to do awesome at the 8K on Monday. I'm going to take it really easy this weekend and hopefully, I'll have a good race, too. I felt really drained all day today, and I definitely had a lazy afternoon. After lunch, I got my pillow and a blanket and laid on the couch to watch a movie. I somehow found the movie Prisoners on OnDemand, and it ended up being really good! It ended just in time to go get the kids from the bus stop. We don't have any plans for the weekend, which will actually be kind of nice. Jerry is off work, and the weather is supposed to be in the mid-70's. We have lots of yard work to do, so it should be a good weekend for it! Prisoners was an excellent movie but SO disturbing!